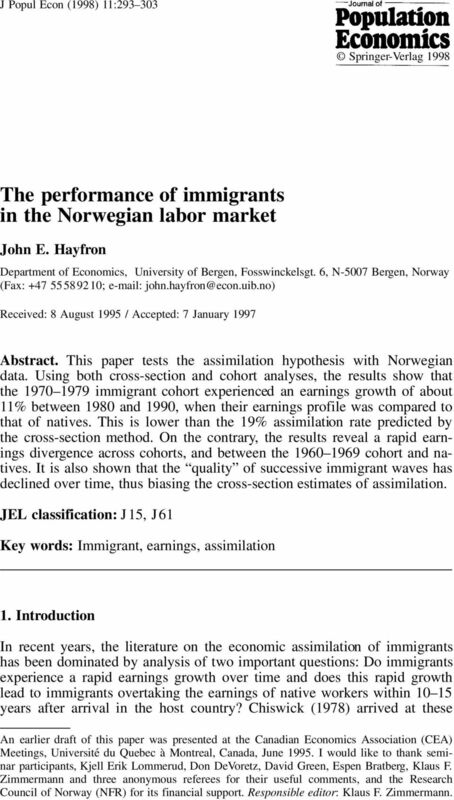 Download "The performance of immigrants in the Norwegian labor market"
1 J Popul Econ (1998) 11: Springer-Verlag 1998 The performance of immigrants in the Norwegian labor market John E. Hayfron Department of Economics, University of Bergen, Fosswinckelsgt. 6, N-5007 Bergen, Norway (Fax: ; Received: 8 August 1995 / Accepted: 7 January 1997 Abstract. This paper tests the assimilation hypothesis with Norwegian data. 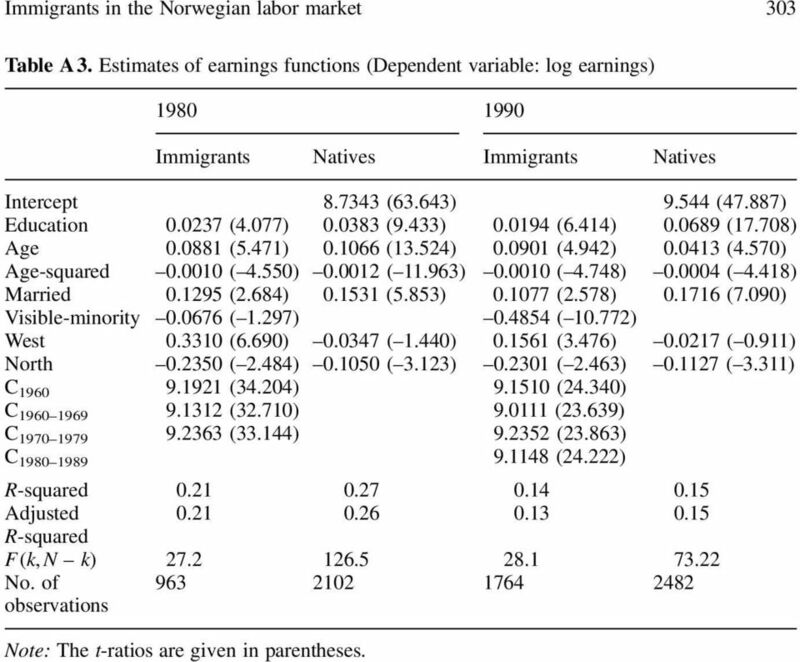 Using both cross-section and analyses, the results show that the immigrant experienced an earnings growth of about 11% between 1980 and 1990, when their earnings profile was compared to that of natives. This is lower than the 19% assimilation rate predicted by the cross-section method. On the contrary, the results reveal a rapid earnings divergence across s, and between the and natives. It is also shown that the quality of successive immigrant waves has declined over time, thus biasing the cross-section estimates of assimilation. JEL classification: J 15, J 61 Key words: Immigrant, earnings, assimilation 1. Introduction In recent years, the literature on the economic assimilation of immigrants has been dominated by analysis of two important questions: Do immigrants experience a rapid earnings growth over time and does this rapid growth lead to immigrants overtaking the earnings of native workers within years after arrival in the host country? Chiswick (1978) arrived at these An earlier draft of this paper was presented at the Canadian Economics Association (CEA) Meetings, Université du Quebec à Montreal, Canada, June I would like to thank seminar participants, Kjell Erik Lommerud, Don DeVoretz, David Green, Espen Bratberg, Klaus F. Zimmermann and three anonymous referees for their useful comments, and the Research Council of Norway (NFR) for its financial support. Responsible editor: Klaus F. Zimmermann. 2 294 J. E. Hayfron conclusions following his cross-section study on the relative performance of white foreign-born males in the U.S. labor market. 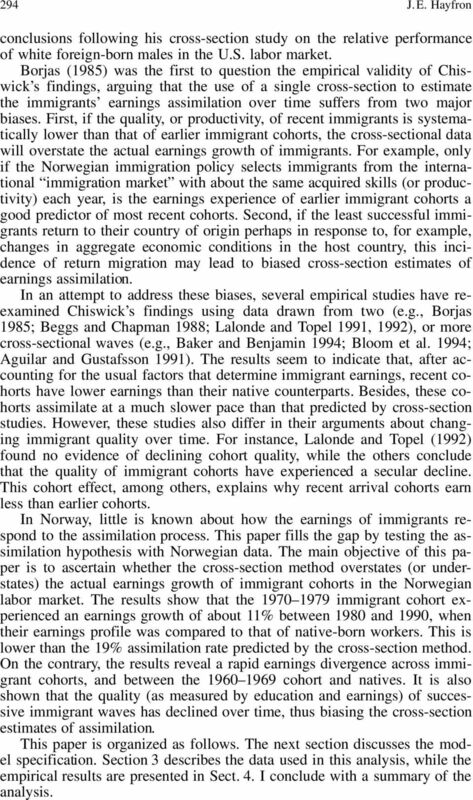 Borjas (1985) was the first to question the empirical validity of Chiswick s findings, arguing that the use of a single cross-section to estimate the immigrants earnings assimilation over time suffers from two major biases. First, if the quality, or productivity, of recent immigrants is systematically lower than that of earlier immigrant s, the cross-sectional data will overstate the actual earnings growth of immigrants. For example, only if the Norwegian immigration policy selects immigrants from the international immigration market with about the same acquired skills (or productivity) each year, is the earnings experience of earlier immigrant s a good predictor of most recent s. Second, if the least successful immigrants return to their country of origin perhaps in response to, for example, changes in aggregate economic conditions in the host country, this incidence of return migration may lead to biased cross-section estimates of earnings assimilation. In an attempt to address these biases, several empirical studies have reexamined Chiswick s findings using data drawn from two (e.g., Borjas 1985; Beggs and Chapman 1988; Lalonde and Topel 1991, 1992), or more cross-sectional waves (e.g., Baker and Benjamin 1994; Bloom et al. 1994; Aguilar and Gustafsson 1991). The results seem to indicate that, after accounting for the usual factors that determine immigrant earnings, recent s have lower earnings than their native counterparts. Besides, these s assimilate at a much slower pace than that predicted by cross-section studies. However, these studies also differ in their arguments about changing immigrant quality over time. For instance, Lalonde and Topel (1992) found no evidence of declining quality, while the others conclude that the quality of immigrant s have experienced a secular decline. This effect, among others, explains why recent arrival s earn less than earlier s. In Norway, little is known about how the earnings of immigrants respond to the assimilation process. This paper fills the gap by testing the assimilation hypothesis with Norwegian data. 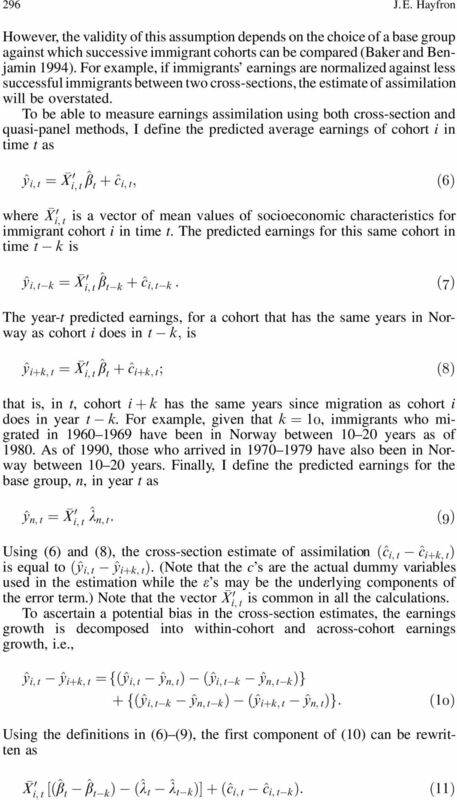 The main objective of this paper is to ascertain whether the cross-section method overstates (or understates) the actual earnings growth of immigrant s in the Norwegian labor market. The results show that the immigrant experienced an earnings growth of about 11% between 1980 and 1990, when their earnings profile was compared to that of native-born workers. This is lower than the 19% assimilation rate predicted by the cross-section method. On the contrary, the results reveal a rapid earnings divergence across immigrant s, and between the and natives. It is also shown that the quality (as measured by education and earnings) of successive immigrant waves has declined over time, thus biasing the cross-section estimates of assimilation. This paper is organized as follows. The next section discusses the model specification. Section 3 describes the data used in this analysis, while the empirical results are presented in Sect. 4. I conclude with a summary of the analysis. 3 Immigrants in the Norwegian labor market Model specification The model specification draws heavily on that in Baker and Benjamin (1994). (See also Borjas 1985; Lalonde and Topel 1991, 1992). 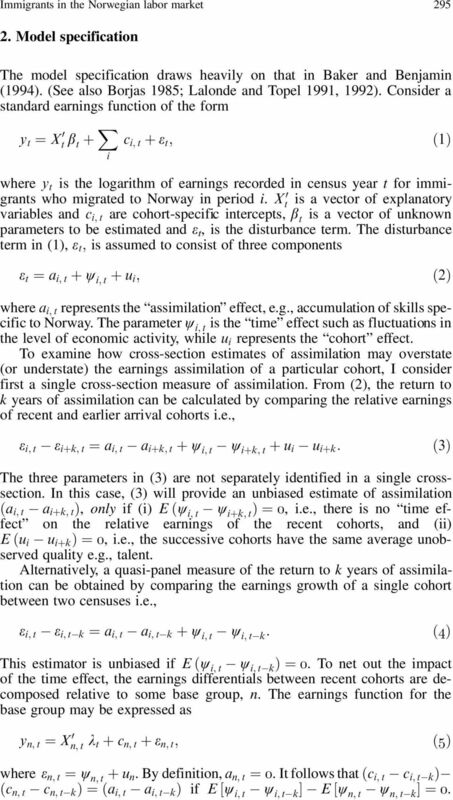 Consider a standard earnings function of the form y t ˆ X 0 t b t X i c i; t e t ; 1 where y t is the logarithm of earnings recorded in census year t for immigrants who migrated to Norway in period i. X 0 t is a vector of explanatory variables and c i; t are -specific intercepts, b t is a vector of unknown parameters to be estimated and e t, is the disturbance term. The disturbance term in (1), e t ; is assumed to consist of three components e t ˆ a i; t w i; t u i ; 2 where a i; t represents the assimilation effect, e.g., accumulation of skills specific to Norway. The parameter w i; t is the time effect such as fluctuations in the level of economic activity, while u i represents the effect. To examine how cross-section estimates of assimilation may overstate (or understate) the earnings assimilation of a particular, I consider first a single cross-section measure of assimilation. From (2), the return to k years of assimilation can be calculated by comparing the relative earnings of recent and earlier arrival s i.e., e i; t e i k; t ˆ a i; t a i k; t w i; t w i k; t u i u i k : 3 The three parameters in (3) are not separately identified in a single crosssection. In this case, (3) will provide an unbiased estimate of assimilation a i; t a i k; t, only if (i) E w i; t w i k; t ˆ0, i.e., there is no time effect on the relative earnings of the recent s, and (ii) E u i u i k ˆ0, i.e., the successive s have the same average unobserved quality e.g., talent. Alternatively, a quasi-panel measure of the return to k years of assimilation can be obtained by comparing the earnings growth of a single between two censuses i.e., e i; t e i; t k ˆ a i; t a i; t k w i; t w i; t k : 4 This estimator is unbiased if E w i; t w i; t k ˆ0. To net out the impact of the time effect, the earnings differentials between recent s are decomposed relative to some base group, n. The earnings function for the base group may be expressed as y n; t ˆ X 0 n; t k t c n; t e n; t ; 5 where e n; t ˆ w n; t u n. By definition, a n; t ˆ 0. It follows that c i; t c i; t k c n; t c n; t k ˆ a i;t a i;t k if E w i; t w i; t k Š E w n;t w n;t k Šˆ0. 5 Immigrants in the Norwegian labor market 297 After netting out the impact of time effect on the earnings of recent s, and given fixed effects, this within- growth captures changes due to net differences in market returns to individual characteristics and changes due to assimilation. Similarly, the second component (i.e. the across- growth) can be rewritten as X 0 i; t ^b t k ^b t ^k t k ^k t Š ^c i; t k ^c i k; t : 12 Equation (12) measures the potential bias in the cross-section estimates of earnings growth. 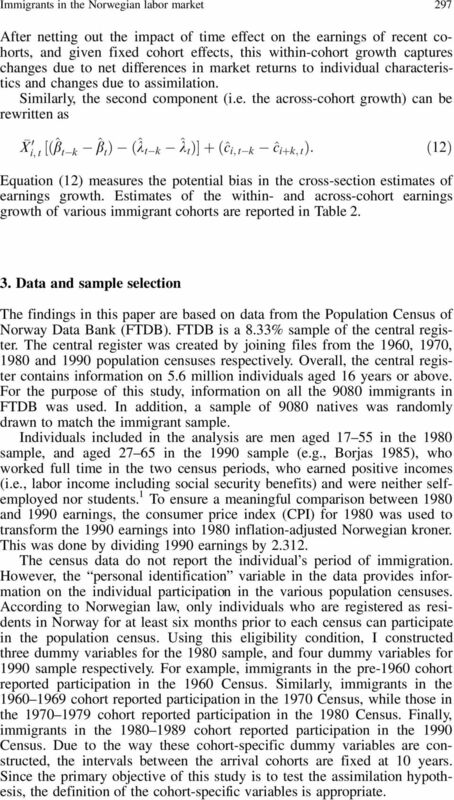 Estimates of the within- and across- earnings growth of various immigrant s are reported in Table Data and sample selection The findings in this paper are based on data from the Population Census of Norway Data Bank (FTDB). FTDB is a 8.33% sample of the central register. The central register was created by joining files from the 1960, 1970, 1980 and 1990 population censuses respectively. Overall, the central register contains information on 5.6 million individuals aged 16 years or above. For the purpose of this study, information on all the 9080 immigrants in FTDB was used. In addition, a sample of 9080 natives was randomly drawn to match the immigrant sample. Individuals included in the analysis are men aged in the 1980 sample, and aged in the 1990 sample (e.g., Borjas 1985), who worked full time in the two census periods, who earned positive incomes (i.e., labor income including social security benefits) and were neither selfemployed nor students. 1 To ensure a meaningful comparison between 1980 and 1990 earnings, the consumer price index (CPI) for 1980 was used to transform the 1990 earnings into 1980 inflation-adjusted Norwegian kroner. This was done by dividing 1990 earnings by The census data do not report the individual s period of immigration. However, the personal identification variable in the data provides information on the individual participation in the various population censuses. According to Norwegian law, only individuals who are registered as residents in Norway for at least six months prior to each census can participate in the population census. Using this eligibility condition, I constructed three dummy variables for the 1980 sample, and four dummy variables for 1990 sample respectively. For example, immigrants in the pre-1960 reported participation in the 1960 Census. Similarly, immigrants in the reported participation in the 1970 Census, while those in the reported participation in the 1980 Census. Finally, immigrants in the reported participation in the 1990 Census. Due to the way these -specific dummy variables are constructed, the intervals between the arrival s are fixed at 10 years. Since the primary objective of this study is to test the assimilation hypothesis, the definition of the -specific variables is appropriate. 6 298 J. E. Hayfron Table 1. Differences in average earnings and education for recent immigrants and natives A: Immigrants relative log earnings a All immigrants Cohort: Arrivals Arrivals Arrivals < 1960 Arrivals B: Immigrants years of completed schooling b All immigrants Arrivals Arrivals Arrivals < 1960 Arrivals Natives Note: The statistics are calculated in the subsample of men aged (27 55) in 1980 (1990) Censuses respectively. a The percentage earnings differential between immigrants and comparable natives equals 100(e X 1), where X is the average differences between log earnings of immigrants and natives. b Average years of completed schooling among immigrants and natives in both samples. The results presented in Table 1 show a downward trend in earnings and education of immigrants relative to natives over the decade. In 1980 the average immigrant had 11.8 years of education and earned about 7.6% more than natives. In 1990, the average education of immigrants has dropped to 9.5 years. Similarly, immigrants earned about 17.4% less than natives. 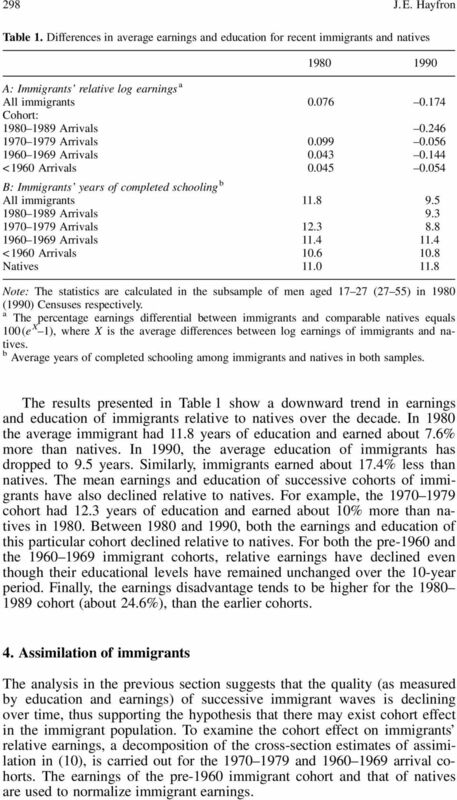 The mean earnings and education of successive s of immigrants have also declined relative to natives. For example, the had 12.3 years of education and earned about 10% more than natives in Between 1980 and 1990, both the earnings and education of this particular declined relative to natives. For both the pre-1960 and the immigrant s, relative earnings have declined even though their educational levels have remained unchanged over the 10-year period. Finally, the earnings disadvantage tends to be higher for the (about 24.6%), than the earlier s. 4. 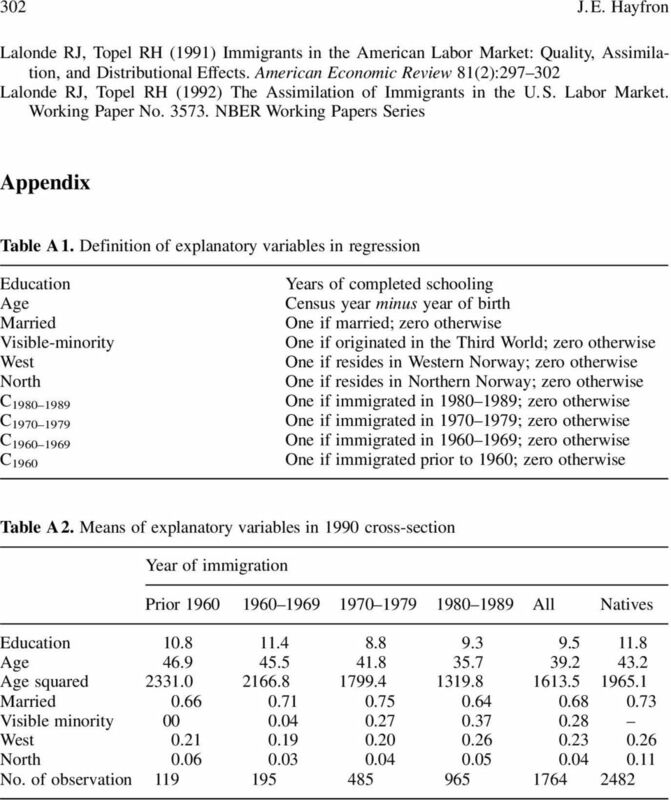 Assimilation of immigrants The analysis in the previous section suggests that the quality (as measured by education and earnings) of successive immigrant waves is declining over time, thus supporting the hypothesis that there may exist effect in the immigrant population. 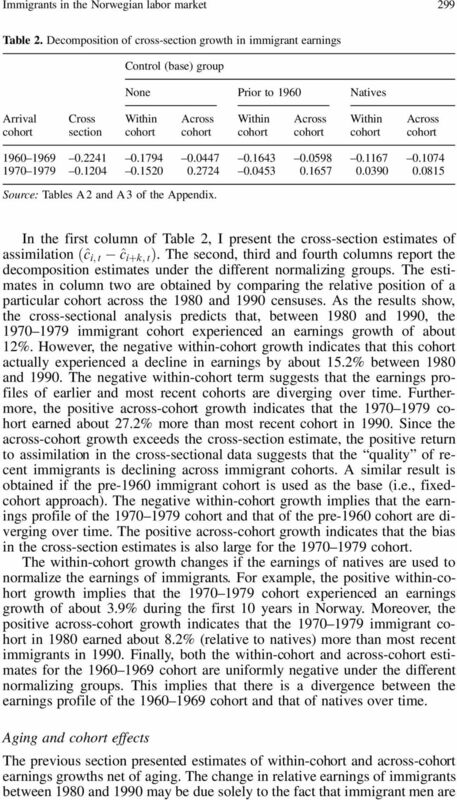 To examine the effect on immigrants relative earnings, a decomposition of the cross-section estimates of assimilation in (10), is carried out for the and arrival s. The earnings of the pre-1960 immigrant and that of natives are used to normalize immigrant earnings. 8 300 J. E. Hayfron Table 3. Pure aging plus within- growth Control (base) group Pure aging Cross-section None Prior to 1960 Natives Note: The aging effect is calculated as D i D n ˆ 10 ^q i ^q n ^c i ^c n 20 X 100, where ^q is estimated coefficient of the age variable, and ^c the estimated coefficient of the agesquared variable obtained from the immigrant and native regressions respectively (see, e.g., Borjas 1985). X is mean age of immigrants in a particular. 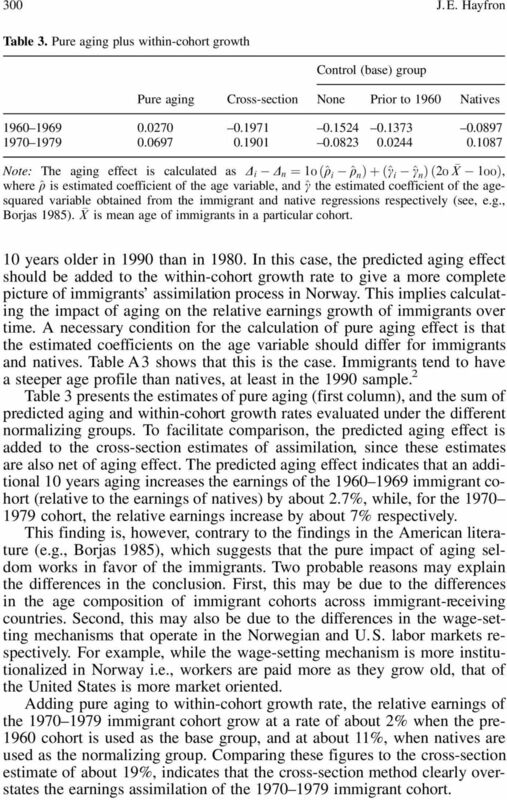 10 years older in 1990 than in In this case, the predicted aging effect should be added to the within- growth rate to give a more complete picture of immigrants assimilation process in Norway. This implies calculating the impact of aging on the relative earnings growth of immigrants over time. A necessary condition for the calculation of pure aging effect is that the estimated coefficients on the age variable should differ for immigrants and natives. Table A3 shows that this is the case. Immigrants tend to have a steeper age profile than natives, at least in the 1990 sample. 2 Table 3 presents the estimates of pure aging (first column), and the sum of predicted aging and within- growth rates evaluated under the different normalizing groups. To facilitate comparison, the predicted aging effect is added to the cross-section estimates of assimilation, since these estimates are also net of aging effect. The predicted aging effect indicates that an additional 10 years aging increases the earnings of the immigrant (relative to the earnings of natives) by about 2.7%, while, for the , the relative earnings increase by about 7% respectively. This finding is, however, contrary to the findings in the American literature (e.g., Borjas 1985), which suggests that the pure impact of aging seldom works in favor of the immigrants. Two probable reasons may explain the differences in the conclusion. First, this may be due to the differences in the age composition of immigrant s across immigrant-receiving countries. Second, this may also be due to the differences in the wage-setting mechanisms that operate in the Norwegian and U. S. labor markets respectively. For example, while the wage-setting mechanism is more institutionalized in Norway i.e., workers are paid more as they grow old, that of the United States is more market oriented. Adding pure aging to within- growth rate, the relative earnings of the immigrant grow at a rate of about 2% when the pre is used as the base group, and at about 11%, when natives are used as the normalizing group. Comparing these figures to the cross-section estimate of about 19%, indicates that the cross-section method clearly overstates the earnings assimilation of the immigrant. 11 Immigrants in the Norwegian labor market 303 Table A3. Estimates of earnings functions (Dependent variable: log earnings) Immigrants Natives Immigrants Natives Intercept (63.643) (47.887) Education (4.077) (9.433) (6.414) (17.708) Age (5.471) (13.524) (4.942) (4.570) Age-squared ( 4.550) ( ) ( 4.748) ( 4.418) Married (2.684) (5.853) (2.578) (7.090) Visible-minority ( 1.297) ( ) West (6.690) ( 1.440) (3.476) ( 0.911) North ( 2.484) ( 3.123) ( 2.463) ( 3.311) C (34.204) (24.340) C (32.710) (23.639) C (33.144) (23.863) C (24.222) R-squared Adjusted R-squared F(k, N k) No. of observations Note: The t-ratios are given in parentheses. "The Self-Employment Experience of Immigrants to Canada"
East-West Migration and Gender: Is there a Double Disadvantage vis-à-vis Stayers? CHAPTER III ECONOMIES OF SCALE This chapter relates to scale economies of the banks and has been divided into four sections. The first part discusses economic theory of the economies of scale of the firms. Intergenerational Mobility of Immigrants in Germany: Moving with Natives or Stuck in their Neighborhoods? NBER WORKING PAPER SERIES THE LABOR DEMAND CURVE IS DOWNWARD SLOPING: REEXAMINING THE IMPACT OF IMMIGRATION ON THE LABOR MARKET. George J. DOES GOVERNMENT R & D POLICY MAINLY BENEFIT SCIENTISTS AND ENGINEERS? DOES GOVERNMENT R & D POLICY MAINLY BENEFIT SCIENTISTS AND ENGINEERS? Austan Goolsbee University of Chicago, GSB, American Bar Foundation, and National Bureau of Economic Research Presented at the A.E.A. 4 Immigration in High-Skill Labor Markets The Impact of Foreign Students on the Earnings of Doctorates George J. Borjas 4.1 Introduction The rapid growth in the number of foreign students enrolled in U.S.
Do Proctored Exams Matter In Online Classes?